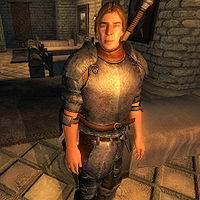 Sten the Ugly is a Nord crusader and a member of the Anvil Fighters Guild. Like the other Nord in the guildhall, Vigdis, Sten hates both winter and snow and prefers the warmer climate of the Gold Coast. Sten the Ugly does not offer any training but spends most of his time training himself. Like the other residents, he sleeps on the ground floor every night between 2am and 6am. After waking up he strolls lazily around the building for two hours until he finds himself a spot in the sleeping area and stands still until noon. After a two-hour breakfast on the second floor he heads down to the training area for a sparring session using his claymore against Block master Huurwen. He returns to the sleeping area at 6pm and eats a two-hour dinner at 8pm. At 10pm he loiters sleepily around the entire guildhall until his late bedtime at 2am. During the day, he wears a set of iron armor including a cuirass, a set of greaves, and a pair of boots. He also owns a random set of lower-class clothing that he slips into when he goes to bed. His weapon of choice is an iron claymore. He carries whatever clothing he is not wearing and a small amount of gold. Sten has the ability to use a leveled set of crusader spells and one extra Restoration spell. The first time you meet Sten, he will explain his unflattering nickname: "Everyone calls me Sten the Ugly. I got tired of beating people up for it. So go ahead. Live it up." He will also provide a bit of amusing information on the huge concentration of Nords in the Anvil Guild Hall: "You notice all the Nords around here? It's partly because Nords like ships and sailing. Mostly, we're sick of freezing our asses off in Skyrim." This page was last modified on 12 July 2018, at 02:08.